VW magazine titled 'Safer Motoring'. Homepage. This page: Two copies of an independent Volkswagen car magazine from the 1966. A scan of the shelves in any reasonably-sized newsagent, will reveal a huge number of motoring magazines. New cars, old cars, American cars, German cars, and so it goes on, with several of the most popular marques represented by maybe four or five different monthly titles. At a time when "online" is (seemingly) everything, accessible by a wide variety of devices at home, at the office, and on the move, it seems surprising that so many niche magazines are still being published. In the 1960s though, things were a lot simpler. If you wanted a general read about the latest models due to be launched, then a reader in Britain might pick up a copy of Autocar, or Motor, for example. For hands-on advice about keeping your car on the road, publications such as Car Mechanics would probably be the logical choice. Make- or model-specific magazines were few and far between, outside of the dealerships and their in-house titles. Owners and enthusiasts of the Volkswagen, whether it be the Beetle car, or a split-screen light commercial, had it better than most. "Safer Motoring", copies of which feature here, was an independent monthly magazine, on sale for 2s 6d. Both my copies date to 1966, which formed part of Volume 5 in the series. Issue 1 was published for November and December, 1961. By the early 1980s, it had been re-named to "Safer Volkswagen Motoring", while in 1985 it simply became "Volkswagen Motoring". February 1966's copy features on its cover a smart two-tone Karman Ghia 1200 coupe, owned by a hairdresser by the name of Rae Voyce. The backdrop is the town of Sumner, in New Zealand. Fast-forward to July's issue, and a split-screen VW Micro Bus used for tours of the Tsavo National Park - complete with Masai warriors for company - takes centre stage. Flicking through both copies, the usual types of articles can be found. What stands out though, is how popular the market for tuning and accessorising one's VW was back in the 1960s, a pastime that continues to this day. I suppose with modest amounts of power being offered by the standard production vehicles, as with the contemporary Mini and the like, plenty of people were keen to pep up their cars' performance, without breaking the bank and creating an unruly, fire-breathing, rip-snorting, track weapon. The adverts in the back of the July issue, contain several private ads for Judson superchargers (and another by Shorrocks), and Koni shock absorbers. Following on, is a box advert for Cartune Limited, an outfit who could work wonders with your VW's engine, suspension and brakes, offering goodies such as anti-rollbars, wheel spacers, straight-through tailpipes, and disc brakes, to the go-faster set. 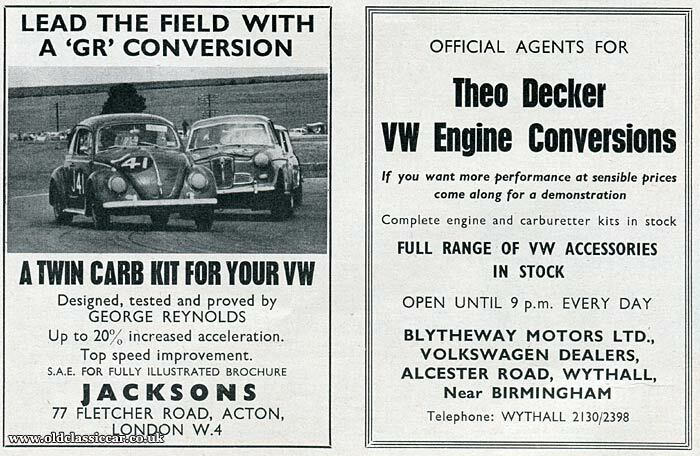 Two other companies vying for a slice of the VW tuning market, were Jacksons, of Fletcher Roasd in Acton, London, and dealers Blytheway Motors Ltd, who were agents for the Theo Decker engine conversions (as were Continental Car Conversions). 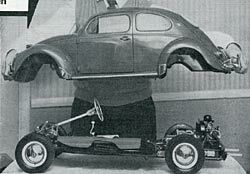 The former offered a twin carb setup for the aircooled Volkswagen engine, as designed and tested by a Mr George Reynolds. A 20% increase in acceleration was promised. Engine and carb sets were also on offer in the Theo Decker range of uprating goodies. An article in the February issue takes a closer look at the Theo Decker operation, located in Essen, Germany. 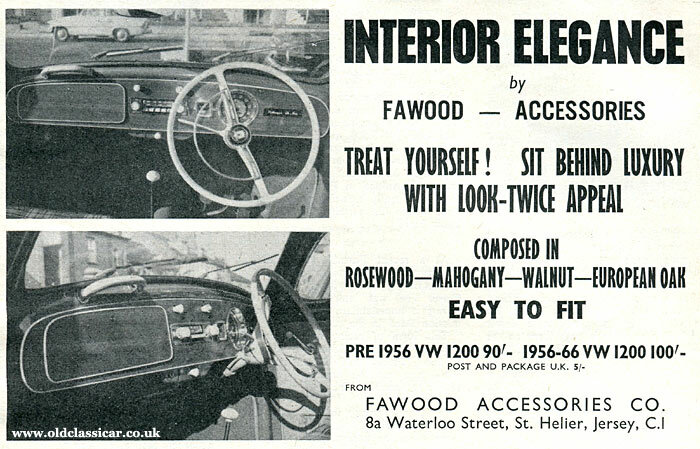 If lifting the interior ambience, rather than raising top speed, was sir or madam's preference, then perhaps the "luxury with look-twice appeal" wooden dashboard would fit the bill? The following was offered by Fawood Accessories Co. of St. Helier, Jersey. 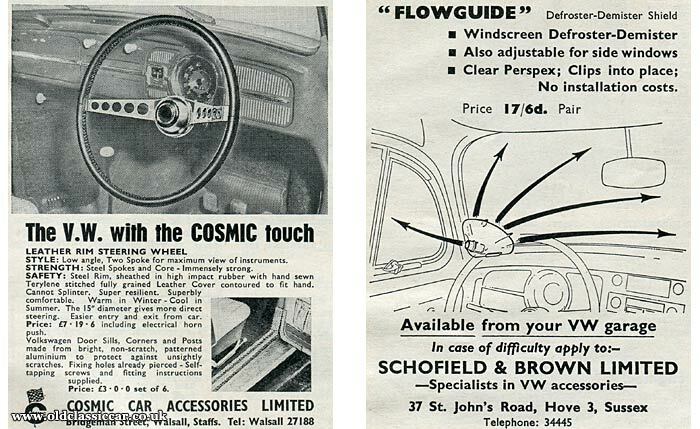 A Cosmic alloy and leather-rimmed steering wheel would also spruce the interior of any VW, while the "Flowguide" - produced by Schofield & Brown Limited, would take car of defrosting and demisting a car's windscreen during inclement weather conditions. In theory. One magazine's centrespread is given over to a fantastic model Beetle, that a Mr Stephens crafted at home over a period of five years. Correct in every detail, the starting point for this impressive build was an ashtray - or rather five ashtrays - ones that occasionally can still be found today, where the circular glass tray is surrounded by a very realistic-looking crossply tyre. Using the reproduction tyres as a starting point, everything else was scaled up accordingly. The finished vehicle measured 12.5" in height, and 36.5" in length and was finished in a bright red colour. Where is it now I wonder? It was a superb creation, so it would be nice to think that it survives somewhere, perhaps in a loft gathering dust, or preferably proudly displayed as part of a model VW display. Does anyone know? A magazine about VWs is always going to be more than just about Beetles. 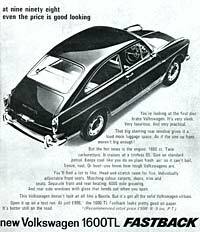 The rear cover of February's issue has a full-page advertisement for the 1600TL Fastback, "the first disc brake Volkswagen. It's very sleek. Very luxurious. And very practical". Again the air-cooled engine is hung out at the back, in this case a 1600cc unit fed by twin carburettors that enables an 85mph cruising speed. More good news: "... it can't boil, freeze, rust". While the first two claims are unquestionably correct, to say that it cannot rust is pushing the bounds of credibility somewhat - just ask anyone who has restored one - unless they're referring to there being no internal waterways in the engine to corrode. 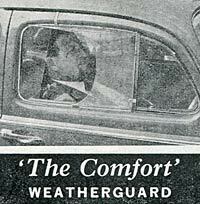 The editor wasn't afraid to feature other, rival, cars to the VW within Safer Motoring's pages. In a series titled "How the other Foreign Cars go", cars similar to VW's are given a thorough going-over. One is the NSU Prinz 1600S, a boxy rear-engined creation about which the tester broadly enthused over during the test. The handling was deemed safe enough, although simple improvements could be made by anyone choosing to buy one of these pint-sized motor-cars: "Although the nose of the car bounces somewhat over rough ground when the boot is empty, a 5-gallon canister of fuel in the front boot was sufficient to steady this behaviour. I still found the car completely controllable, however, even with the boot empty". I doubt modern-day road-testers would be so forgiving. Both issues are packed with advertisements for dealerships, keen to sell the reader their next new car. For a manufacturer that was a fairly recent arrival to UK shores, especially given the country they came from, the level of take-up within the British market is quite something. 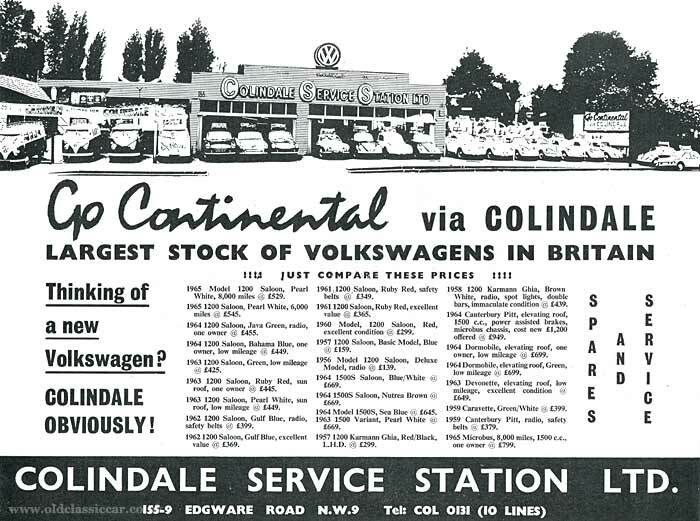 That's not to say that everyone was keen to have German cars being sold in the UK, so soon after the war had ended, and many owners were at the receiving end of less-than-complimentary comments from colleagues and neighbours alike. 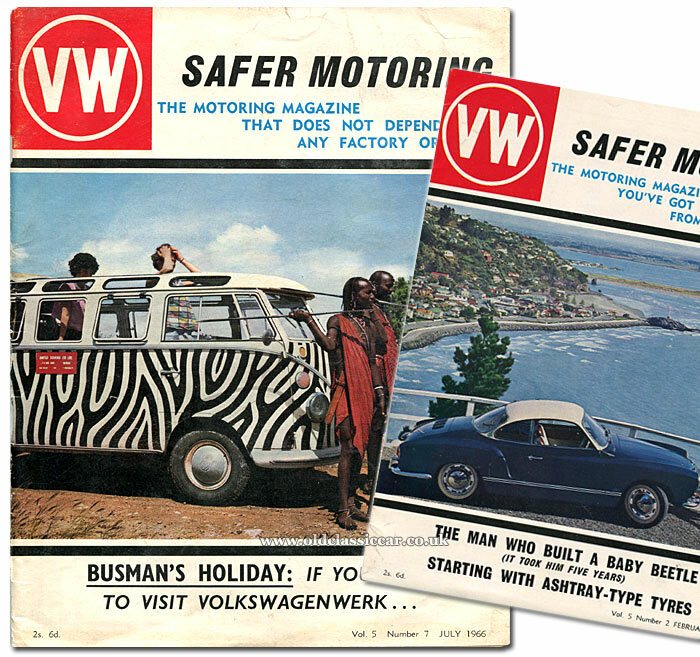 Old copies of Safer Motoring are well worth hunting down, if the early days of VW in the UK are of interest. Other old VWs on OCC. Period VW Beetle photos page 1. Period VW Beetle photos page 2. Karmann Cabriolet in the 1950s. Don's memories of a 1953 Beetle. 1938 original KDF-Wagen brochure description.